The Portland Bill Lighthouse. Original, painted in acrylic ink on paper, as part of the Mural project for the Heights Hotel. Framed in 1” light Oak with ivory mount-board. 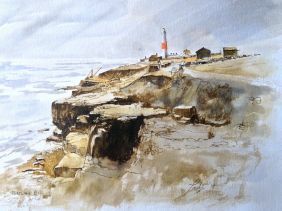 Winner of the Coast and seascapes competition of Artist’s and Illustrator’s magazine. Certificate is posted on reverse. Also available as prints and cards. A3 signed and numbered & limited edition prints (50). Available to order only. Flat packed in cellophane and HP balanced materials. A4 unlimited print. Flat packed.